Friends don't let friends use SeatGuru. There are lots of carriers/configs where it's just not current. Delta's 7HD config - a refurbed 777-200ER with Premium Select but no Comfort+ - as described in the Wiki is one such animal. Is there a better resource? All I want to figure out is if row 40 where it's only 2x seats is going to have recline or be backed against a wall or partition. There are more inaccuracies than accuracies on seatguru. So flipping a coin would be a better resource. Flyertalk would be a MUCH better resource. Thanks, and understood. The weird thing is that the seat map on the actual flight i'm on doesn't even match Delta's own seat map on either the 777ER or 777LR by one row. Super strange. You're still not understanding (I think). 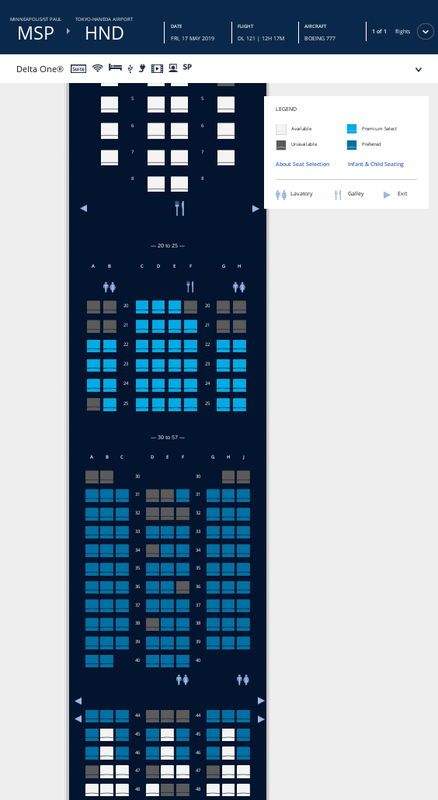 It doesn't match Delta's own seat map, because Delta's own seat map (at least the ones you can get to if you just Google "Delta 777 seat map" or follow the navigation links on the web site) is showing the pre-modded 777s without suites. In contrast, if you make a booking and/or pull up a reservation that is booked on a flight that they intend to operate with the modded 7HD/7HB that *does* have suites, they are showing some sort of interim seat map for the purposes of seat selection, but they have yet to post one that you can reach via Google or simply navigating the Delta web site outside the context of a booking. That's why it doesn't match. The above 4 routes have been running with D1 seating - to be returned to non D1 type aircraft. mmmmmm. Will the above be used as some of the first A330-900neos routes (which will have the D1 seating) so customers that would expect to have D1 will not be disappointed? I'm not the expert here, just courious on what DL's thoughts are on their future decisions. The ATL CDG ATL 777 just moves from early flight 82/83 to late flight 84/85, happily. Finally makes sense, thanks. I'm going to just guess that row 40 has full recline and that's vacant for exit row. I just viewed flightaware on tail number N867DA. Its itinerary is HNL-NRT (Jan 5) then NRT-LAS-NRT (Jan 6). Might this be the next 772 to go into SIN for the refit? Guess that LAS-NRT is not a regular segment for the 772's. Just wondering. If this is truly the next refit, there is only one that is left for the SIN monthly stop (N861DA). DL can then continue with the 9 remaining 77L's refits. I'm still hearing that all 777's will be completed early summer 2019 schedule. NRT-LAS-NRT must be for CES. Wow. 11 Rows of Comfort+ on the refurbished 777s? That is awesome.